Alain Enthoven and Wayne Smith’s classic, How much is enough?,1 is as much relevant for today’s defence planners as it was during the Cold War. The key issue raised by the authors, who were assistants to Secretary of Defence, Robert S. McNamara, was not so much the quantum of resources spent on defence but the manner in which decisions are made with respect to force structure and weapons acquisition. Enthoven and Smith make a compelling argument that choosing among the feasible alternatives, keeping in view the cost-effectiveness and overall national security requirements, is a pragmatic way to determine resource requirements. Yet, defence decision-makers and influencers of today continue to be more concerned about how much is provided, driven by the belief that greater the resources allocated the better defence preparedness would be. This focus on the quantum of resources allocated has often led to a demand that a certain percentage of the gross domestic product (GDP) be annually devoted to defence. Even the Parliamentary Standing Committee on Defence has articulated such a demand. In a report submitted to Parliament in March 2017, the Committee, while recommending greater allocation for defence, categorically stated that three per cent of the GDP is “optimal and necessary for ensuring the operational preparedness of the Forces.”2 In its earlier reports as well, the Committee had made similar observations. But, is such a demand for allocating three per cent of GDP for defence realistic, keeping in view the resource constraints confronting the government, the current state of socio-economic development, and the existing scope for optimisation of resources within defence? This Issue Brief examines the feasibility and affordability of raising the share of defence to three per cent of GDP. In so doing, it estimates the current defence burden by mapping all the expenses that are met through the Ministry of Defence (MoD). A distinction is made between what is commonly accepted as official defence expenditure and the MoD’s total expenditure, in order to assess the quantum of the actual defence burden. The Brief argues that MoD’s total allocations should be considered for any discussion on defence expenditure since the official defence expenditure does not capture all the expenses that the government incurs on national defence efforts. India’s defence expenditure is not defined properly. In the absence of a formal definition, what is commonly perceived as the official defence budget is the Defence Services Estimates (DSE), an annual publication of the finance wing of the Ministry of Defence (MoD). The DSE does not, however, cover all the expenses incurred on national defence. As of 2018-19, it contains only two out of four Demands for Grants of the MoD. These two are: Demand No. 20 and Demand No. 21. Demand No. 20 caters to the revenue expenditure of not only the three armed forces (Army, Navy and the Air Force), but also of Ordnance Factories (OFs), Defence Research and Development Organisation (DRDO), inspection organisation, Rashtriya Rifles (RR) and National Cadet Corps (NCC). Demand No. 21 is a consolidated one and caters for the capital expenses of all the entities included in Demand No 20. For fiscal year 2018-19, allocations under these two demands add up to Rs 2,79,305 crore, and represents the country’s commonly accepted official defence budget. The two Demands for Grants excluded from the purview of the DSE, but which belong to MoD and are therefore part of the national defence expenditure are: Demand No. 19 (MoD (Miscellaneous)) and Demand No. 22 (Defence Pensions). Together, these two items form what can be called MoD’s other expenses. Demand No. 19 caters for organisations and elements such as Border Roads Organisation, Coast Guard, Defence Estates Organisation, Military Firms and the Ex-Servicemen Contributory Health Scheme. Besides, it also meets the secretariat general expenses of various MoD offices. For its part, Demand No. 22 caters for the retirement benefits of defence services personnel. If these two Demands are added to the DSE, the total amount allocated to the MoD in 2018-19 stands at Rs 4,04,364 crore (Table 1), representing a little over 30 per cent of what is commonly understood as the official defence budget. There is no rationale why these two demands, which are fully paid for from the taxpayers’ money, should be excluded from any discussion on defence expenditure. The debate on Defence-GDP ratio in India is a skewed one because of two reasons: one, the lack of a proper definition of the defence budget, as referred to earlier; and two, the lack of appreciation about the central government’s resource constraints. Because of the lack of a proper definition of what constitutes the defence budget, the defence-GDP ratio is often discussed with reference to the DSE, which, as mentioned earlier, does not capture all the expenses incurred by the MoD, and hence does not show the correct picture. With respect to the DSE, India’s defence budget (Rs 2,79,305 crore) as a percentage of the estimated GDP of 2018-19 (Rs 187,22,302 crore) stands at 1.49 per cent. However, if the MoD’s overall budget (Rs 4,04,364 crore) is taken into account, then the share of defence in GDP jumps to 2.16 per cent. Critics may argue that, even if such an expansive approach to what constitutes the defence expenditure were to be adopted, a near continuous decline in the defence-GDP ratio cannot be denied. 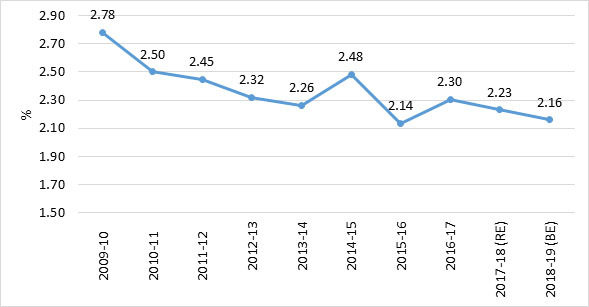 As Figure 1 shows, MoD’s expenditure as a percentage of GDP has been on a near continuous fall in the past 10 years. Note: The base year of GDP for first two years is 2004-05 and for the rest years 2011-12. GDP figures for 2017-18 and 2018-19 are Provisional Estimate and Budget Estimate, respectively. Defence expenditure up to 2016-17 are actual and for 2017-18 and 2018-19 are revised estimate and budget estimate, respectively. However, such a decline does not mean defence’s declining priority in resource allocation. An examination of central government expenditure (CGE) trends would reveal that, even though its relative spending capacity has declined over the years (largely due to the pressure of fiscal consolidation), its focus on defence has remained largely the same. Figure 2 illustrates this by comparing the CGE with GDP over a 10-year period. As is evident, there has been a nearly three percentage point fall in the share of CGE in GDP during the past decade. This has a huge implication on the government’s expenditure, including on defence, considering the fact that a mere one per cent of GDP (of 2018-19) amounts to a staggering Rs 1,87,223 crore. 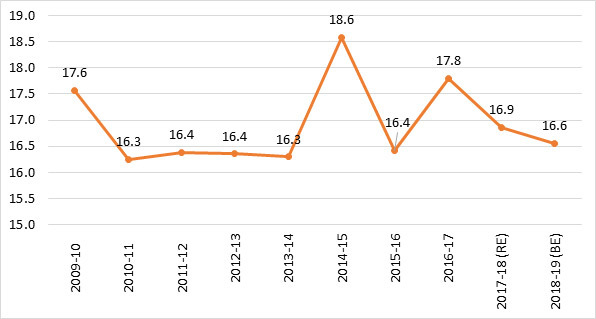 Yet, despite this decline in the CGE-GDP ratio, the central government’s allocation for MoD has largely remained constant at around 16 to 17 per cent during the past decade (Figure 3). It is also noteworthy that increasingly a dwindling portion of the MoD’s allocations is going towards the official defence expenditure. In other words, more and more resources are being consumed by the MoD’s other expenses. Among these other expenses, the one item that has cornered most of the increases in the MoD’s budget in recent years is defence pension. Allocations for defence pensions have grown by a factor of 2.4 (or 139 per cent) during the last six years, owing largely to the implementation of One Rank One Pension (OROP) and the Seventh Central Pay Commission recommendations. As a result, the share of defence pensions in the MoD’s total expenditure has witnessed a quantum jump, from around 18 per cent in 2013-14 to 27 per cent in 2018-19. Note: Figures for 2017-18 and 2018-19 are Revised Estimate and Budget Estimate, respectively. Since there has been a persistent demand that defence expenditure be increased to three per cent of GDP, it is pertinent to examine the financial implications of such a measure. An attempt is made below to see the implication by inflating the MoD’s 2018-19 budget to three per cent of GDP (from the present 2.16 per cent) and then comparing the inflated budget with the total CGE. The hike of the MoD’s budget to three per cent of GDP would raise its allocation by Rs 1,57,305 crore, from the current Rs 4,04,364 crore to Rs 5,61,669 crore. As a percentage share of CGE, the inflated amount would be 23 per cent, as against the current 17 per cent. An important point to note here is that most of this increase would need to be absorbed on the capital side of the MoD’s budget, since most of the other heads, particularly salaries and pensions, are already paid for and do not have much scope to absorb the extra allocation. This would, however, lead to a somewhat piquant situation for the MoD. Its capital expenditure would leave the central government with very little to spend on asset creation outside of the defence sector. MoD’s capital expenditure of Rs 99,564 crore in 2018-19 accounts for 33 per cent of the central government’s total capital expenditure of Rs 3,00,441 crore. Raising the MoD’s capital expenditure by another Rs 1,57,305 crore to Rs 2,56,869 crore would increase the ratio to 85 per cent. Such a high ratio would mean a drastic reduction in the non-defence capital expenditure of the central government – a highly improbable scenario. Even if one accepts such a piquant situation, could the MoD absorb the additional capital funds, considering that the bulk of the capital spending would need to be absorbed through increased procurement? At the moment, capital procurement constitutes about three-fourths of the MoD’s total capital expenditure, with the domestic share of procurement (the so-called self-reliance index) being around 45 per cent. To absorb a capital procurement budget of nearly Rs 1,92,652 crore (75 per cent of Rs 2,56,869 crore), the defence import bill has to increase to Rs 1,05,958 crore (55 per cent of Rs 1,92,652 crore). Such a hike would not only show the Make in India programme in a poor light, but it would also add to the current account deficit. Here, it is important to recall that high import driven defence expenditure in the mid-1980s was one of the major factors for the fiscal and balance of payments crises and the consequent economic misery in the early 1990s.3 A repeat of that unpleasant history naturally ought to be avoided. Besides, another pertinent question is whether it is at all feasible for the central government to enhance MoD’s share in CGE from the present 17 to 23 per cent in order to meet the target of three percent of GDP for defence. The answer lies in understanding how defence expenditure is financed, and the constraints that the government faces while meeting the same. The Seventh Schedule of the Constitution vests the Central Government with the responsibility of national defence. By virtue of this, the central government incurs all the expenses on defence, though several state governments reap the consequent benefits by way of taxing the commercial entities – such as the defence industry – operating in their states. All the expenditures on account of defence are met through the Centre’s receipts, which are of two types: revenue receipts and capital receipts, each of which is further sub-divided into two broad sub-categories (Table 2). It is pertinent to mention that a large portion of the capital receipt is made up of borrowings and other liabilities, which not only add to the fiscal deficit but creates liabilities for the future, and hence need to be contained at a modest level.4 The only major item of receipts which the government has greater freedom to spend is the tax revenue, the real strength of the government’s purse. As can be seen from Table 2, the MoD’s existing allocation for 2018-19 already stands at 27 per cent of total tax revenue. If the MoD’s allocation were to be raised to Rs 5,61,669 crore in order to meet the target of three per cent of GDP, the MoD’s share of total tax revenue will shoot up to 38 per cent. From a public finance perspective, it would be extremely difficult for any government to resort to such a hike. One clear way in which the government can provide three per cent of GDP for defence without aggravating the existing share of the MoD’s allocations in the tax revenue (27 per cent) is through enhanced tax collection (assuming that other components of the government’s receipts remain unchanged). In this respect, the augmentation required in the tax revenue is Rs 5,99,607 crore (over and above Rs 14,80,649 crore), which is 40 per cent higher than what has been estimated in the 2018-19 budget. A substantial increase in tax revenue to the magnitude of close to Rs 6,00,000 crore is, however, easier said than done as it requires an increase in the current tax rate and/or increase in tax base, both of which are difficult to achieve. It may be mentioned that India’s record in tax collection is not up to the international mark, with the current tax-GDP ratio hovering at around 17 per cent. In comparison, the average tax-to-GDP ratio of the Organisation for Economic Co-operation and Development (OECD) countries is more than 34 per cent and that of the Emerging Market Economies (EMSs) is 21 per cent.9 Given this stark reality of the Indian tax collection scenario, it will be quite difficult to substantially augment the government’s non-borrowing revenues and allocate three per cent of GDP for defence. Feasibility apart, such a massive hike in the MoD’s budget would also be extremely unaffordable given the current expenditure profile of the government and the socio-economic development needs of the country. Currently, a substantial part of the government’s expenditure is incurred in the form of interest payment, grants and loans to States and Union Territories, subsidies and defence expenditure, leaving very little for health, education, police and the like (Table 3). Increasing the MoD’s outlays by Rs 1,57,305 crore beyond the current level would require the government to reprioritise its pattern of expenditure. Needless to add, such reprioritisation is likely to prove extremely difficult given extant political and practical constraints. The government’s difficulty increases further given the huge pressure upon it to spend more on socio-economic sectors to enhance the standard of living of a vast majority of the poor that live below the subsistence level. As Table 4 clearly brings out, India is lagging far behind its Brazil, Russia, India, China and South Africa (BRICS) partners in the human development index (HDI), per capital income, and spending on health and education. If India has to improve its human capital to a minimum standard as achieved by other BRICS partners, the government’s socio-economic expenditure has to increase manifold, which, in turn, would mean lesser scope for increasing defence allocations. There is no gainsaying the fact that the current level of defence expenditure is inadequate to meet the country’s security requirements. The gravest of inadequacies seems to be on the capital acquisition front, where there is a shortage of Rs 66,440 crore, or 47 per cent, in 2018-19 (Table 5). The moot question, therefore, is how to address these shortfalls, knowing fully well that a substantial increase (to the magnitude of three per cent of GDP) is neither feasible nor affordable. Before addressing this critical issue, it is pertinent to examine how these shortfalls arise in the first place. This would, in turn, require a critical examination of the defence planning mechanism. Source: Standing Committee on Defence, Demands for Grants 2018-19, 42nd Report. Historically, planning for force structure and equipment procurement has been the responsibility of the individual service headquarters (SHQ), which they have undertaken with little coordination with their sister services or oversight and inputs from the civilian bureaucracy. Since the SHQs have had the freedom to articulate their requirements, the tendency had often been to project the need for greater resources, since more resources mean more manpower, more acquisitions and hence a greater say. This is not necessarily the most efficient way of planning and it has led to a projection of overly ambitious resources. For instance, for the 13th defence five year plan (2017-2022), the amount projected was Rs 26,83,924 crore,10 which is nearly two-and-a-half times of what was spent during the previous plan period. It is largely in this context that any purported shortfall of resources, including for acquisition, has to be viewed. Given resource constraints and the unlikelihood of defence spending being hiked substantially in the near future, one of the immediate priorities before the DPC is to address the current imbalance in the defence budget whereby an increasingly greater amount of resources is being consumed by manpower costs, leaving very little for military modernisation. Suffice it to say that between 2011-12 and 2018-19, the share of manpower cost (pay and allowances, and pensions) in the MoD’s total expenditure has increased from 44 to 56 per cent. This increase has largely come at the cost of capital procurement whose share has gone down from 26 to 18 per cent.13ernisation, but also addressing other resources constraints that the MoD faces. The demand to earmark three per cent of GDP for defence is neither feasible nor affordable at the present juncture, given the dwindling share of the central government expenditure in the GDP, less than desirable tax collection and the acute pressure on the government to investment in socio-economic sectors. While not discounting the need for additional resources for defence, and especially for military modernisation, it may prove far more prudent to optimise the existing defence allocations rather than seek a quantum jump in them. For optimisation of defence allocations, the government needs to strengthen its planning mechanism, and task the newly created DPC to ensure the drawing up of a holistic and integrated defence plan that takes into account the scarcity of resource as well as the genuine security needs of the country. 1. Alan C Enthoven and K. Wayne Smith, How much is enough? Shaping the Defence Programme 1961-69, Rand Corporation: Santa Monica, 1971. 2. Standing Committee on Defence, Demands for Grants 2017-18, Report No. 28, pp. 108-109. 3. Sanjaya Baru, “Security and Sovereignty in an Open Economy: New Thinking after 1991”, in Rakesh Mohan, India Transformed: 25 years of Economic Reforms, Penguin: Gurgaon, 2017, p. 190. 4. For a long time, fiscal deficit (FD) of three per cent of GDP has been accepted as a key fiscal objective of central government. In 2018-19, however, the FD is estimated at 3.3 per cent of GDP. 5. Tax revenue consists of Corporation Tax, Taxes on Income, Customs, Union Excise Duties, and Goods and Services Tax (GST), etc. 6. Non-Tax Revenue comprises interest receipts, dividend and profits, external grants, receipts of Union Territories and other non-tax revenue. 8. Includes drawdown of Cash Balance. 9. Ministry of Finance, Economic Survey 2015-16, Vol. I, p. 108.